May 21 (Bloomberg) -- Crude oil extended its decline in New York on concerns Europe will struggle to contain the sovereign- debt crisis and doubts about the strength of the economic recovery in the U.S., the world’s largest energy consumer. Oil fell for the seventh time in eight days yesterday as French Finance Minister Christine Lagarde said countries that share the euro need greater coordination. The index of U.S. leading economic indicators unexpectedly fell in April, and the most Americans in a month filed applications for unemployment benefits. Crude inventories rose for the 15th time in 16 weeks in the seven days ended May 14. Crude oil for July delivery dropped 78 cents, or 1.1 percent, to $70.02 a barrel, in electronic trading on the New York Mercantile Exchange at 10:15 a.m. Sydney time. The July contract has fallen 7.7 percent this week. Yesterday, the June contract dropped $1.86, or 2.7 percent, to $68.01, the lowest settlement since Sept. 29. 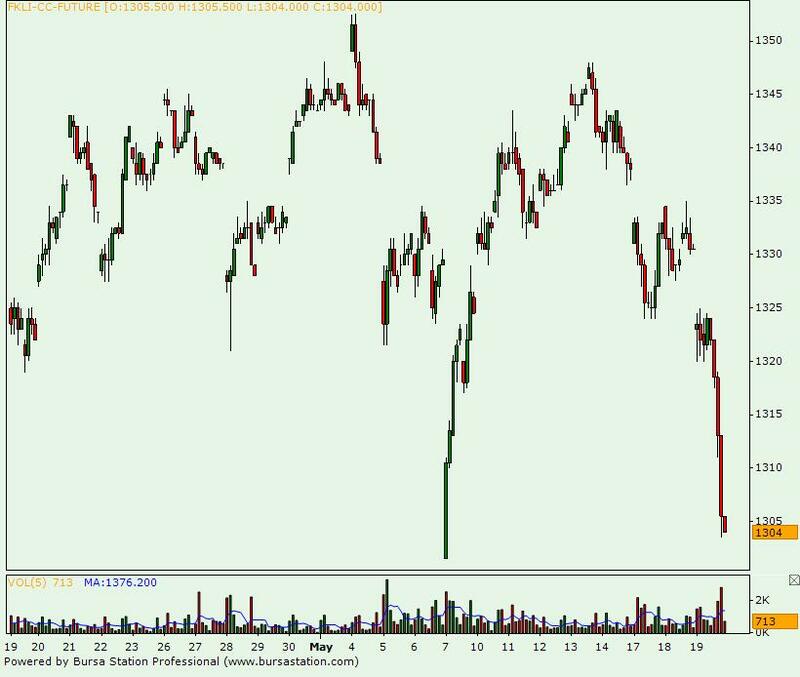 June futures expired at the close of floor trading. The 0.1 percent decrease in the index of U.S. leading economic indicators signaled that the economic expansion may slow in the second half of 2010. It was the first drop in a year for the New York-based Conference Board’s measure of the outlook for three to six months. It followed a revised 1.3 percent gain in March. The Organization of Petroleum Exporting Countries will ship 23.53 million barrels a day in the four weeks to June 5, compared with 23.25 million a day in the month to May 8, the Halifax, England-based tanker-tracker Oil Movements said yesterday. That’s the first reported increase in five weeks. The data exclude Ecuador and Angola. U.S. crude oil stockpiles rose 162,000 barrels to 362.7 million in the week ended May 14, said the Energy Information Administration, the statistical unit of the Energy Department. Supplies were forecast to increase 500,000 barrels, according to the median estimate from 15 analysts surveyed by Bloomberg News. Initial jobless claims in the U.S. rose by 25,000 to 471,000 in the week ended May 15, the highest level since April 9, Labor Department figures showed yesterday in Washington. Applications were projected to drop to 444,000, according to the median estimate of 44 economists in a Bloomberg News survey. Brent crude oil for July settlement dropped 73 cents, or 1 percent, to $71.11 a barrel on the London-based ICE Futures Europe exchange at 10:18 a.m. Sydney time. 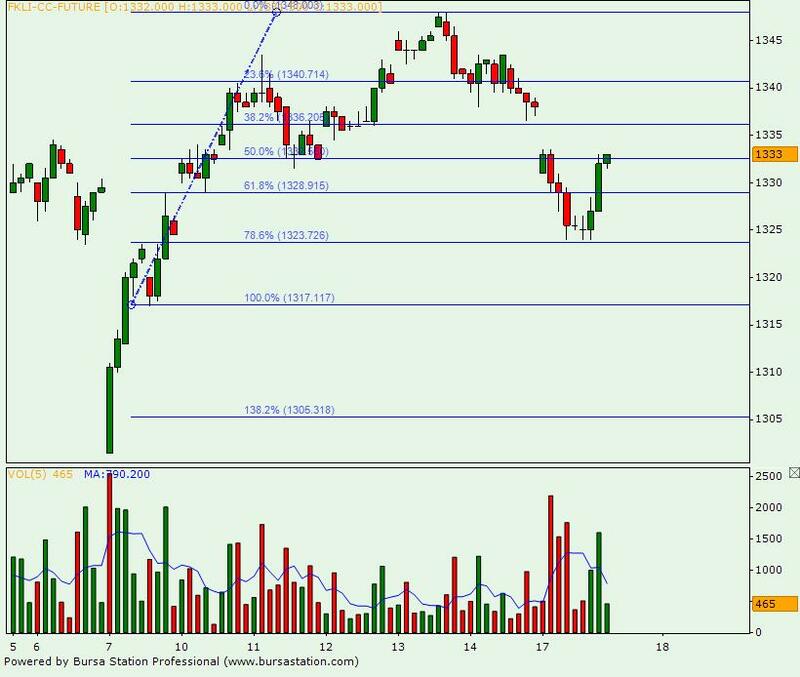 Yesterday the contract declined $1.85, or 2.5 percent, to end the session at $71.84. May 20 (Bloomberg) -- Soybeans rose for the first time in more than a week on speculation that the lowest prices since March will boost demand for supplies from the U.S., the world’s largest grower and shipper. Exporters in the U.S. sold 478,462 metric tons during the week ended May 13, double the average from the prior four weeks, the Department of Agriculture said today. Of the total, 60,000 tons were purchased by China, the world’s biggest importer. Argentina farmers are withholding newly harvested supplies in a bet the peso will plunge, boosting returns on exports, Rosario- based commodity trader Alabern, Fabrega y Cia said. “Export sales were very good and constructive for prices,” said Anne Frick, a vice president of research for Prudential Bache Commodities LLC in New York. “Argentina and Brazil are not selling their crops, and that is boosting demand for U.S. supplies” at a time when importers usually shift to newly harvested soybeans from South America, Frick said. Soybean futures for July delivery rose 5.5 cents, or 0.6 percent, to $9.44 a bushel on the Chicago Board of Trade, after losing 2.8 percent since May 11. The commodity touched $9.31 today, the lowest level for the most-active contract since March 31. Annual consumption in China will increase by as much as 8 percent in the next three or four years as the livestock industry expands, boosting demand for high-protein feed, said Robert Day, the general manager of South China operations for Cargill Inc., the largest privately held U.S. company. Soybean imports by China have outpaced forecasts for five years, Day said. The USDA this month raised its import estimate for the marketing year through Sept. 30 to 46 million tons from 43.5 million in April, and predicted 49 million tons for 2010- 2011. Combined soybean output in Brazil and Argentina, the biggest exporters behind the U.S., will jump 36 percent this year to a record 122 million tons, the USDA estimates. Farmers in Argentina are storing their soybeans to preserve wealth as President Cristina Fernandez de Kirchner pursues a weak-peso policy intended to stimulate exports from the country, South America’s second-largest economy. The sales slowdown has boosted prices in Argentina and Brazil, making U.S. exports more competitive for shipments to Asia from ports in the Pacific Northwest, Frick said. Argentine producers are stockpiling beans in special bags on their farms rather than selling the crops, according to Omar Barchetta, a vice-president of the Rosario-based Argentine Agrarian Federation farmers group. “There was talk yesterday that as much as 250,000 tons of sales from South America were switched to the U.S.,” Frick said. “Prices will likely rise until we see increased exports from South America or cancelations of U.S. sales” from China, Frick said. May 21 (Bloomberg) -- The yen weakened versus the euro and dollar, paring gains this week as the European debt crisis triggered demand for Japan’s currency as a refuge. The yen fell to 112.85 per euro as of 9:23 a.m. in Tokyo from 111.99 yesterday in New York, when it touched 109.65 the strongest since November 2001. Japan’s currency declined to 90.12 versus the dollar from 89.68, trimming a 2.6 percent gain this week. FCPO August Futures contract traded RM41 higher as compare to previous trading sessions to close at RM2476 with a total of 11,741 lots traded in the market. FCPO price traded higher during trading sessions despite crude oil and soybean oil were not trading very encouraging towards north directions. 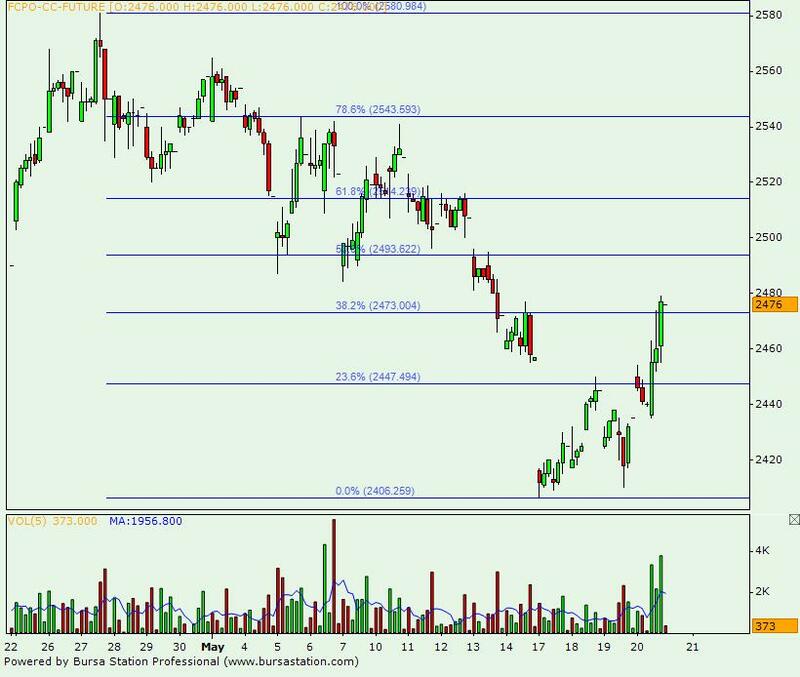 FCPO price seems found support at RM2435 levels; 50% Fibonacci support levels, before starts to surge up to test nearest resistance levels at RM2473 regions. 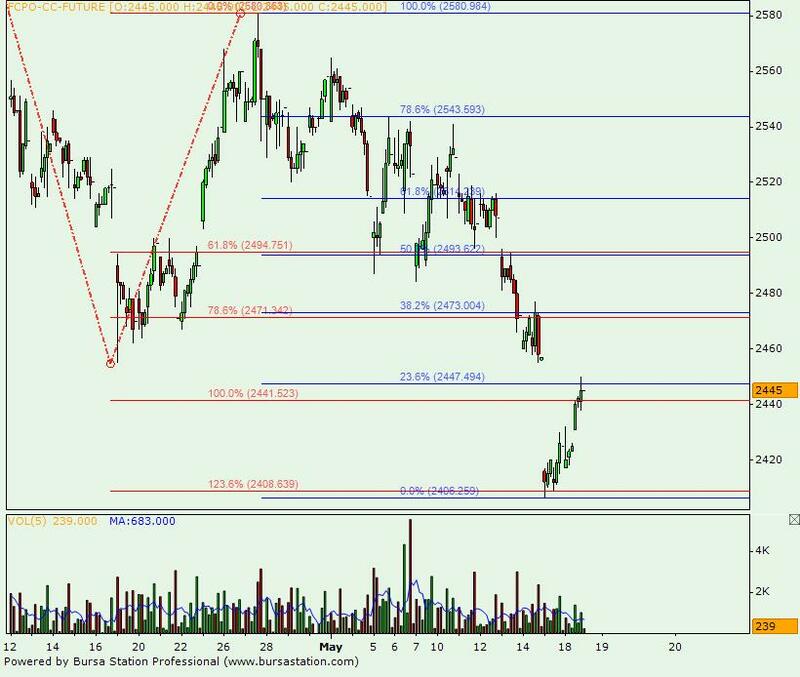 Technically, FCPO price seems attempt to complete rebound wave 4 where coming nearest resistance levels seen at RM2493 and RM2514; 50% and 61.8% Fibonacci resistance levels, after yesterday’s high at RM2479 regions. However, it’s very crucial that FCPO price must not trading below support levels at RM2452 and RM2435 region in order not to trigger greater selling activities. FKLI May Futures contract traded 0.5 points lower as compare to previous trading session to close at 1303.5 levels with a total of 9,739 lots traded in the market. FKLI seems riding on roller coaster during trading sessions as buyers and seller seems putting best effort to take charge while regional indices were trading sideways during trading sessions. 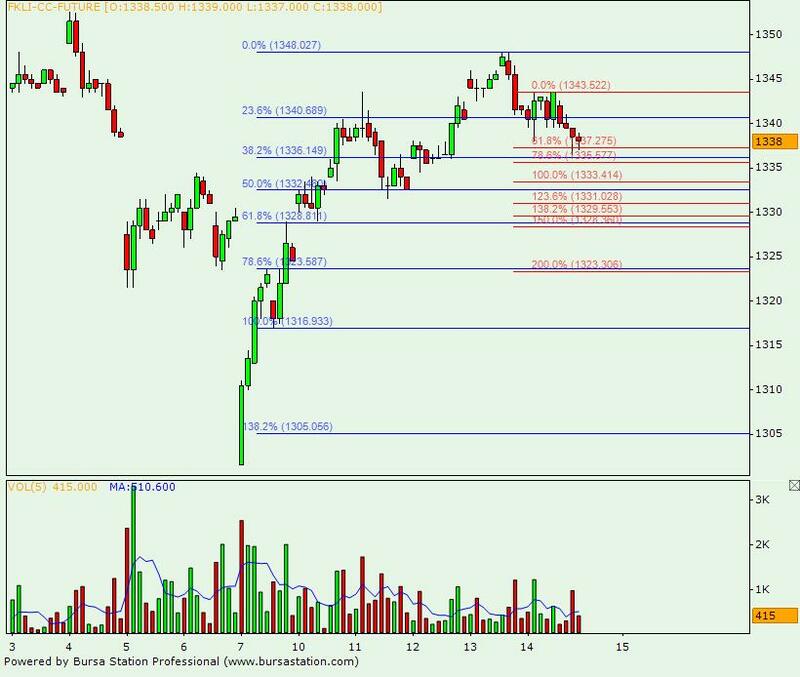 FKLI seems temporary supported above support levels at 1296 regions; 50%, 161.8% and 100% Fibonacci support regions before manage to rebound towards 1308.5 regions at 23.6% Fibonacci resistance levels. Technically, FKLI seems temporary holding above support levels at 1296 regions while resistance levels were anticipated at 1315 and 1322; 38.2% and 50% Fibonacci resistance levels, after today’s high at 1308 regions. 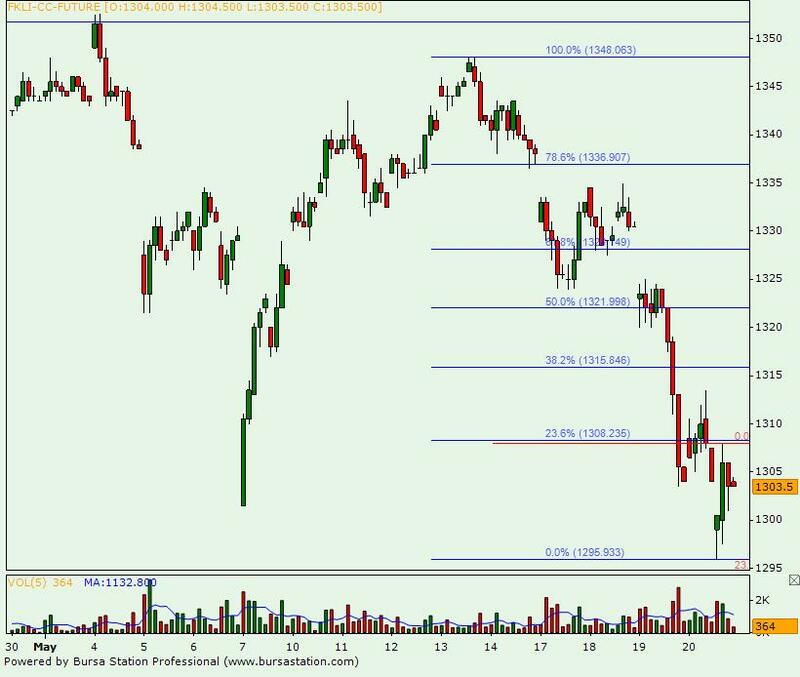 However, FKLI support levels seen at 1279.5 and 1263.5 regions; 50% and 61.8% Fibonacci support levels, must not be violated in the coming trading session. May 20 (Bloomberg) -- Crude oil gained for a second day in New York as some investors took the view a drop below $70 a barrel made the commodity attractive to buy. Oil rose for the first time in seven days yesterday as the euro rebounded from a four-year low against the dollar after Axel Weber, an ECB Governing Council member, said the euro region must tighten its fiscal rules. Crude inventories in the U.S. increased less than expected last week, according to an Energy Information Administration report. Crude oil for June delivery gained 48 cents, or 0.7 percent, to $70.35 a barrel, in electronic trading on the New York Mercantile Exchange at 11:13 a.m. Sydney time. Yesterday, the contract rose 46 cents, or 0.7 percent, to settle at $69.87. June futures expire today. The more active July contract climbed as much as 75 cents, or 1 percent, to $73.23 a barrel. It was at $72.68 at 11:19 a.m. Sydney time. Prices fell early yesterday after Germany’s prohibition on short-selling sparked concern that regulation will increase. German Chancellor Angela Merkel laid out proposals to gain control over “destructive” financial markets after she imposed a unilateral ban on naked short-selling, or bets on the decline of assets an investor doesn’t own. U.S. supplies of crude oil rose 162,000 barrels to 362.7 million in the week ended May 14, an Energy Department report showed yesterday. Stockpiles were forecast to increase 500,000 barrels, according to the median of 15 analyst estimates in a Bloomberg News survey. Inventories at Cushing, Oklahoma, where New York-traded West Texas Intermediate oil is delivered, climbed to a record, the report showed. Stockpiles increased 917,000 barrels to 37.9 million, the highest level since the Energy Department started keeping records at the storage hub in 2004. Gasoline inventories fell 294,000 barrels to 221.8 million. Supplies of gasoline were forecast to decline by 900,000 barrels, according to the Bloomberg News survey. Stockpiles of distillate fuel, a category that includes heating oil and diesel, dropped 979,000 barrels. Brent crude oil for July settlement traded at $73.79 a barrel, up 10 cents, on the London-based ICE Futures Europe exchange. Yesterday, the contract declined 74 cents, or 1 percent, to end the session at $73.69. FCPO July Futures contract traded RM10 lower as compare to previous trading sessions to close at RM2435 with a total of 7,452 lots traded in the market. FCPO seems trading within range during trading sessions despite of wild movement of crude oil and soybean oil electronic trading. FCPO price seems attempt to test support levels at RM2400 regions after 2 attempt to penetrate RM2410 regions. 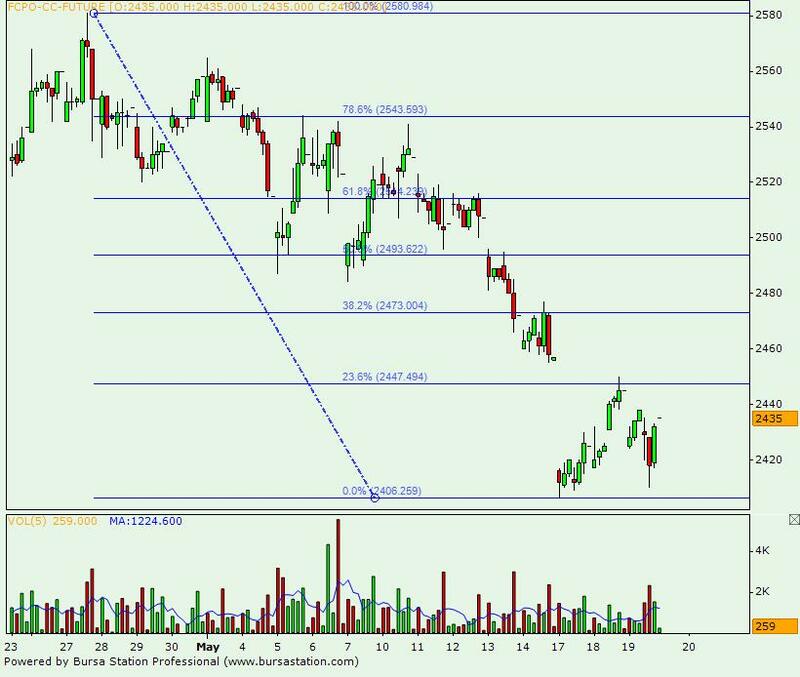 Technically, FCPO price seems temporary consolidating above support levels at RM2415 and RM2406; 78.6% and 100% Fibonacci support level. 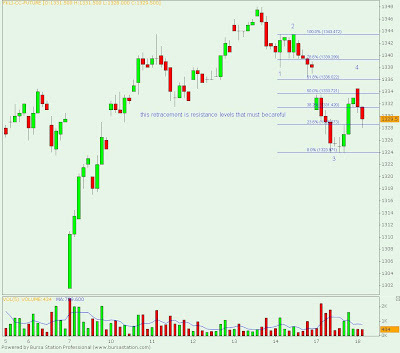 Failure to hold trading price above support levels shall indicates further selling pressure to take place. 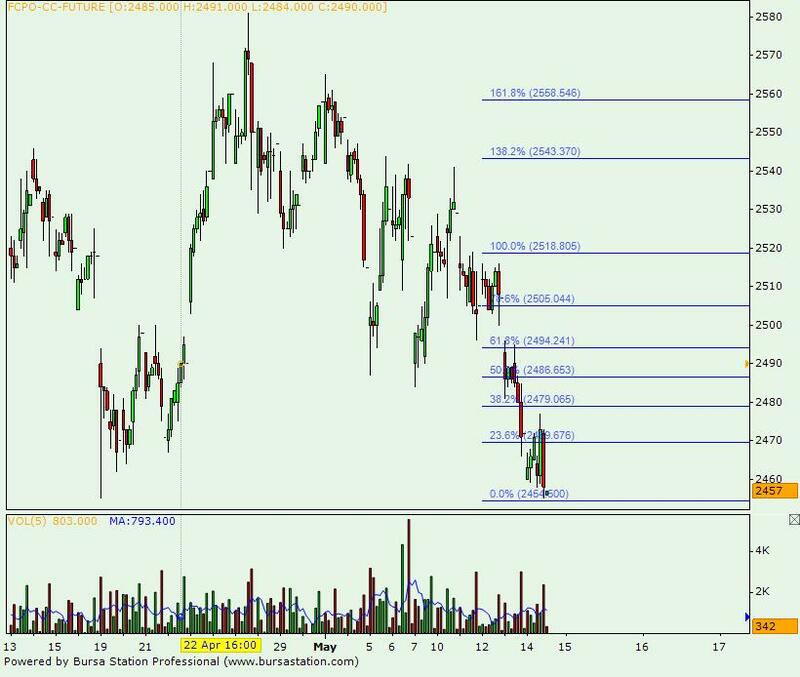 Resistance levels were seen at RM2443 and RM2473 regions; 23.6% and 38.2% Fibonacci resistance levels. 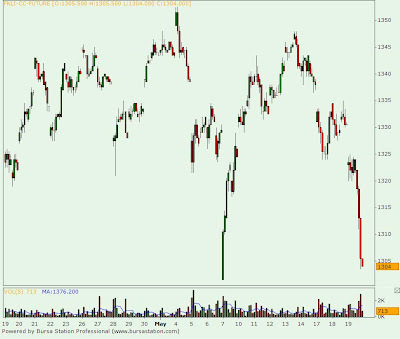 FKLI May Futures contract plunge 26.5 points lower as compare to previous trading session to close at 1304 levels with a total of 11,543 lots traded in the market. FKLI plunge in the afternoon sessions after news release regarding German authorities to impose some restrictions on the trading product which directly influence regional indices plunge lower upon closing. FKLI seems consolidate within range in the earlier sessions before continue to plunge lower towards support levels at 1300 regions. Technically, FKLI seems temporary supported above previous low at 1301.5 regions after plunge lower from consolidate phase at 1320 regions. FKLI would further affirm towards south once support levels at 1301.5 and 1287.5 fails to hold against the selling pressure in the coming trading sessions while resistance levels were seen at 1313 and 1325 regions. May 19 (Bloomberg) -- Crude oil slumped to a seven-month low in New York as the dollar climbed against the euro, curbing the investment appeal of commodities, and after a U.S. industry report showed an increase in stockpiles of gasoline. Oil dropped for a seventh day after the 16-nation currency touched a four-year low versus the greenback on concern European nations will struggle to meet austerity requirements. Gasoline inventories rose 981,000 barrels last week, the American Petroleum Institute said yesterday. Crude oil for June delivery dropped as much as $1.32, or 1.9 percent, to $68.09 a barrel in electronic trading on the New York Mercantile Exchange, the lowest intraday price since Oct. 5. It was at $68.26 at 9:21 a.m. in Sydney. Yesterday, the contract fell 67 cents to $69.41 a barrel, the lowest settlement since Sept. 29. Futures rose as much as 3.5 percent to $72.52 yesterday. The dollar traded at $1.2182 against the euro at 8:47 a.m. Sydney time, after climbing 1.6 percent yesterday. The euro fell after Germany said it will ban naked short-selling and naked credit-default swaps of euro-area sovereign debt and the Bank of Italy allowed lenders to exclude losses on government bonds. An Energy Department report today will probably show that U.S. inventories of crude oil climbed for the 15th time in 16 weeks. Stockpiles rose 500,000 barrels in the seven days ended May 14 from 362.5 million the week before, according to the median of 15 analyst estimates in a Bloomberg News survey. Supplies of distillate fuel, a category that includes heating oil and diesel, climbed 1 million barrels from 153.8 million, according to the survey. Gasoline stockpiles declined 900,000 barrels from 222.1 million the prior week. Crude supplies declined 794,000 barrels last week, according to the American Petroleum Institute report. Brent crude oil for July delivery declined 67 cents, or 0.9 percent, to end the session at $74.43 on the London-based ICE Futures Europe exchange yesterday. May 19 (Bloomberg) -- Soybeans for July delivery fell 0.2 percent to $9.375 a bushel on the Chicago Board of Trade at 7:12 a.m. Singapore time. Wheat for July delivery dropped 0.2 percent to $4.67 a bushel and July delivery corn was little changed at $3.595 a bushel. FCPO July Futures contract traded RM20 higher as compare to previous trading sessions to close at RM2445 with a total of 4,649 lots traded in the market. FCPO price was mainly trading higher during trading sessions despite soybean oil and crude oil were traded weak during overnight and electronic trading. FCPO price seems trading higher in the hourly price chart despite was opened lower for trading. Technically, FCPO price seems trading on rebound wave 4 were next nearest resistance levels were seen at RM2473 and RM2493; both are 38.2% and 50% Fibonacci resistance level, after previous resistance levels at RM2447 was challenged for the 1st time. 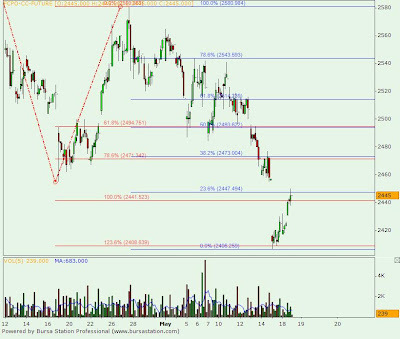 However, FCPO would resume bearish trading range once support levels at RM2428 and RM2415; both are 50% and 78.6% Fibonacci support levels, were violated in the coming trading sessions. 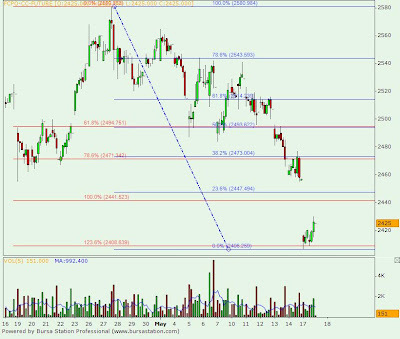 FKLI May Futures contract was traded 2.5 points lower as compare to previous trading session to close at 1330.5 levels with a total of 5,461 lots traded in the market. FKLI was mainly traded sideways during trading session as regional indices were traded mix during trading sessions despite Dow Jones futures electronic trading were traded higher. 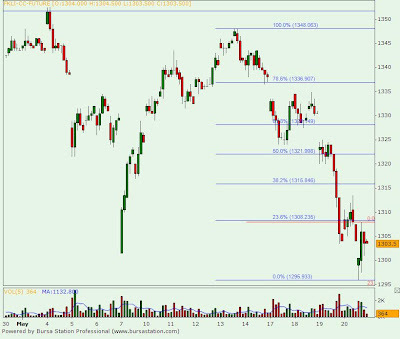 FKLI seems consolidate within range from 1333.5 to 1330.5 regions despite attempted to test resistance levels at 1336; 50% Fibonacci resistance levels. 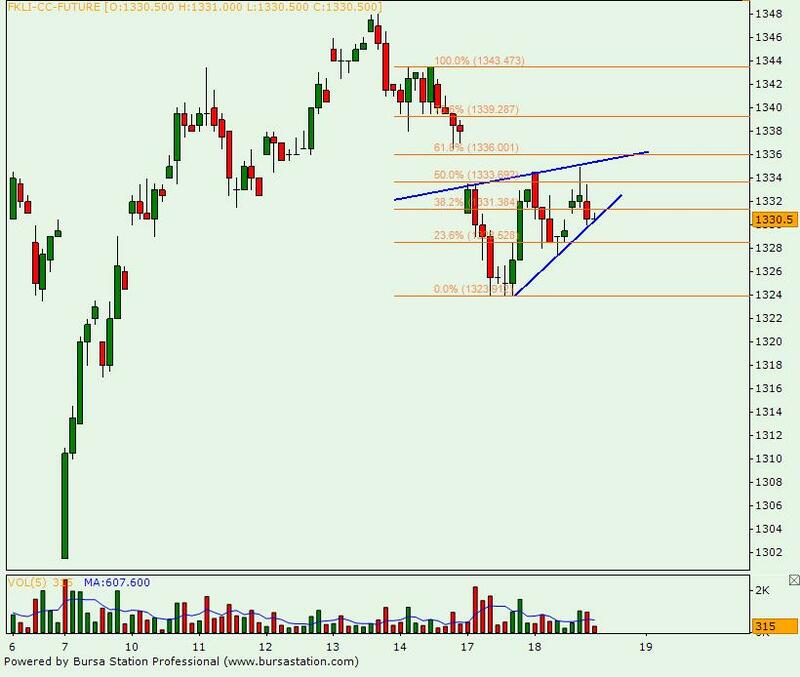 Technically, FKLI seems forming a rising wedge formation in the hourly price chart where nearest support levels seen at 1327.5 and 1324 regions. 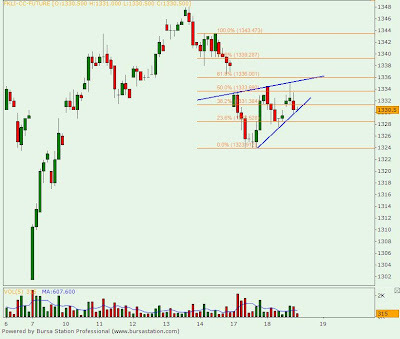 Rising wedge formation shows tendency to jeopardy the uptrend formation provided resistance levels at 1336 and 1343.5, 61.8% and 100% Fibonacci resistance levels were not overcome in the coming trading sessions. May 18 (Bloomberg) -- Gold traded little changed in Asia after falling yesterday as near-record prices prompted some investors to sell the precious metal. Gold for immediate delivery rose 0.2 percent to $1,224.85 an ounce at 8:10 a.m. in Sydney. It fell 0.9 percent yesterday, after reaching a record $1,249.40 on May 14. June futures fell 0.3 percent to $1,224.50 an ounce. The contract closed barely changed yesterday after reaching a record $1,249.70 on May 14. Platinum for immediate delivery fell 0.3 percent to $1,665.5 an ounce, its fourth straight decline. Silver was little changed at $18.90 an ounce after falling 2.3 percent yesterday. Palladium was untraded after slumping 3.9 percent yesterday, its biggest one-day decline in almost two weeks. May 18 (Bloomberg) -- Crude oil rose, snapping five days of declines, as some investors took the view a drop below $70 a barrel made the commodity attractive to buy. Oil pared yesterday’s 2.1 percent drop as the euro’s rebound from a four-year low bolstered optimism the shared European currency will weather the region’s debt crisis. A U.S. Energy Department report tomorrow will probably show that refinery operating rates increased and gasoline inventories dropped, according to a Bloomberg News survey. Crude oil for June delivery gained as much as 64 cents, or 0.9 percent, to $70.72 a barrel in electronic trading on the New York Mercantile Exchange, and was at $70.38 at 9:02 a.m. Singapore time. Yesterday, the contract fell $1.53 to $70.08 a barrel, the lowest settlement since Dec. 14. Prices had tumbled to $69.27 yesterday. The dollar was at $1.2357 per euro from $1.2395 in New York. The euro weakened before a report forecast German investor confidence fell in May, after rising yesterday. Refineries probably operated at 88.6 percent of capacity last week, up 0.2 percentage point from the previous week, according to the median of analyst responses before the Energy Department report. “Refinery operations have been reasonably good,” National Australia Bank’s Westmore said. Gasoline supplies declined 1 million barrels from 222.1 million the prior week, according to the Bloomberg survey. U.S. crude oil stockpiles probably increased by 625,000 barrels, the 15th time in 16 weeks as imports climbed. Brent crude oil for July delivery increased as much as 80 cents, or 1.1 percent, to $75.90 a barrel, on the London-based ICE Futures Europe exchange, and was at $75.71 at 8:31 a.m. Singapore time. Yesterday, the contract slipped $2.83, or 3.6 percent, to $75.10. FCPO July Futures contract traded RM32 lower as compare to previous trading sessions to close at RM2425 with a total of 7,210 lots traded in the market. FCPO manage to recover partially as crude oil and soybean oil manage to recover some before end of trading sessions. FCPO price consolidate within range from RM2405 to RM2420 regions before starts to trade and settle higher before end of trading sessions. Technically, FCPO price would expect further rebound provided support levels at RM2409 and RM2388 were not violated in the coming trading sessions. 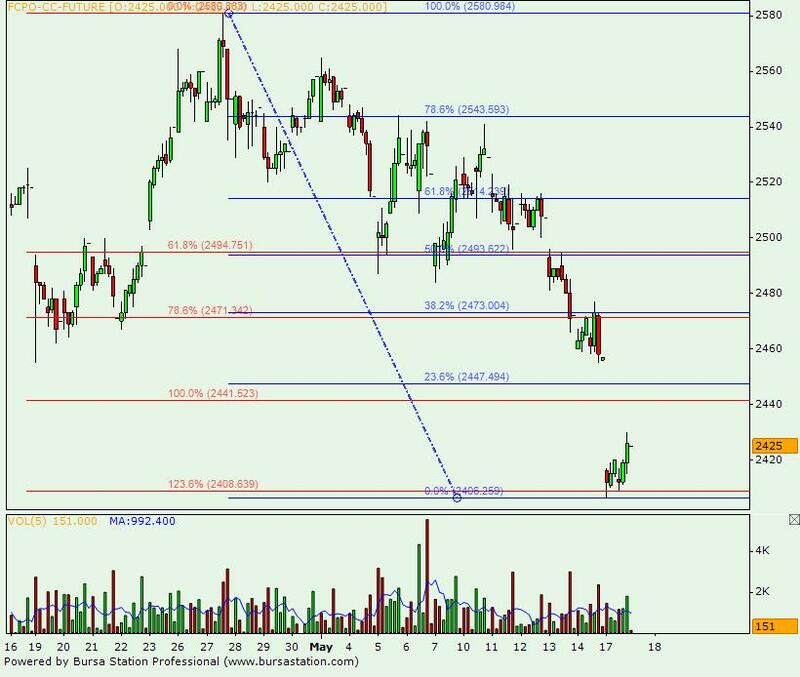 However, FCPO price would anticipate some selling activities around resistance levels at RM2447 and RM2473, both are 23.6% and 38.2% Fibonacci resistance levels. FKLI May Futures contract was traded 5 point lower as compare to previous trading session to close at 1333 levels with a total of 9,964 lots traded in the market. FKLI settled slightly lower as compare previous after recovered from major losses during morning sessions despite most of the regional indices were traded lower during trading sessions. FKLI consolidate between 1324 and 1326 regions; 78.6% Fibonacci support levels, before starts to surge higher3 hours before end of trading sessions. 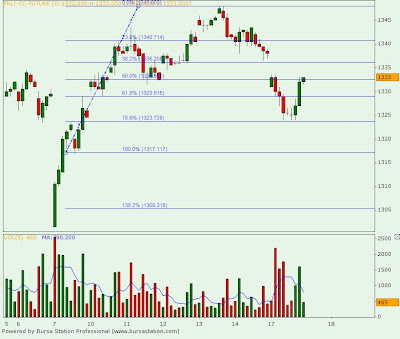 Technically, FKLI seems temporary support above 1323.5 and 1317 regions; 78.6% and 100% Fibonacci support levels in the hourly price chart. However, it’s still crucial that FKLI to overcome resistance levels at 1343.5 and 1352.5 in order to affirm FKLI is currently riding on bull trend. May 17 (Bloomberg) -- Crude oil traded near a three-month as the sovereign debt crisis in Europe rattled investor confidence and risked slowing the global economy’s recovery from its worst recession since World War II. Oil’s 16 percent plunge this month is being driven by Europe’s debt crisis and is beyond OPEC’s influence, Qatar’s Energy Minister Abdullah al-Attiyah said May 15. The euro fell to an 18-month low earlier today on speculation austerity measures planned by indebted nations including Spain and Greece will cut growth in the region. Crude oil for June delivery was at $71.59 a barrel, down 2 cents, in after-hours electronic trading on the New York Mercantile Exchange at 7:54 a.m. in Singapore. It earlier rose as much as 0.7 percent to $72.13. The contract tumbled as much as 4.8 percent on May 14 as global equities sank and the euro fell for a fourth week. Oil closed at $71.61 a barrel, the lowest settlement since Feb. 5. While there is a risk that Europe’s woes will weigh on the global recovery, there is no evidence of any “substantial impact” yet, CWA’s Hassall said. The global economy will recover and there will be investors buying oil at current levels to profit from the longer-term demand recovery, he said. “I don’t believe it’s going to continue to fall,” he said. A report tomorrow in the U.S., the world’s largest oil user, will probably show new home construction last month reached the highest annual pace since November 2008, according to a survey of economists. Oil will likely continue to trade between $70 and $90 a barrel, the head of Credit Suisse’s European oil and gas group said yesterday. New York prices, particularly the near-month contract, have also been depressed by rising U.S. stockpiles, Hassall said. “This is typically around the time we see inventories peak in the U.S. It will be interesting to see if the builds continue, and over time, just how quickly they get drawn down,” he said. U.S. crude oil supplies rose 1.95 million barrels to 362.5 million in the week ended May 7, the 14th increase in 15 weeks, as refiners cut processing rates, the Energy Department reported last week. Inventories were 6.1 percent above the five-year average for the period. Brent crude oil for July delivery rose 4 cents to $77.97 a barrel on the London-based ICE Futures Europe exchange. It fell 4.3 percent to $77.93 a barrel on May 14. The Nymex July contract fell 13 cents to $75.30 a barrel. Hedge fund managers and other large speculators reduced their bets on rising oil prices to a two-month low last week, according to U.S. Commodity Futures Trading Commission data. Speculative net-long positions, the difference between orders to buy and sell the commodity, fell 15 percent to 92,895 contracts on the New York Mercantile Exchange in the week ended May 11, the commission said last week. May 14 (Bloomberg) -- Soybeans fell, capping the first three-week decline since early February, after an industry report showed an unexpected decline in demand from U.S. processors in April. Consumption fell 12 percent to 131.7 million bushels from March and dropped 1.8 percent from a year earlier, the National Oilseed Processors Association said in a report today. Traders surveyed by Bloomberg News expected 137.1 million, on average. Member firms reported inventories of cooking oil rose 3.8 percent to 2.81 billion pounds from a year earlier. Soybean futures for July delivery fell 11 cents, or 1.1 percent, to $9.535 a bushel on the Chicago Board of Trade. For the week, the price slipped 0.7 percent, the third straight decline. Soybeans are down 9.1 percent this year on forecasts of record production in Brazil and Argentina, the two biggest exporters after the U.S.
Prices also fell on concern that Europe’s debt crisis will worsen, hampering the global economy and curbing demand for soy- based foods, animal feed and cooking oil. Former Federal Reserve Chairman Paul Volker said Greece’s fiscal woes may cause the breakup of the euro area after an unprecedented $1 trillion bailout. Global equity markets fell and the Reuters/Jefferies CRB Index of 19 commodities slipped to a three-month low. The soybean crop in the U.S., the world’s largest grower, was valued at $31.8 billion last year, second only to corn at $48.6 billion, government figures show. FCPO July Futures contract traded RM15 lower as compare to previous trading sessions to close at RM2457 with a total of 7,671 lots traded in the market. FCPO struggles to rebound higher after opened lower due to weak crude oil and soybean oil overnight and electronic trading. FCPO price plunge lower to test previous support low at RM2455 after attempt to penetrate resistance levels at RM2473; 23.6% Fibonacci resistance level, failed. Technically, it’s possible that FCPO trading price would rebound higher provided support level at RM2444 and RM2430 were not violated in the coming trading sessions. 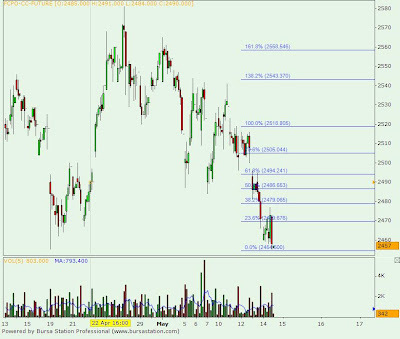 Resistance levels were expected around RM2486 and RM2505, 50% and 78.6% Fibonacci resistance levels. 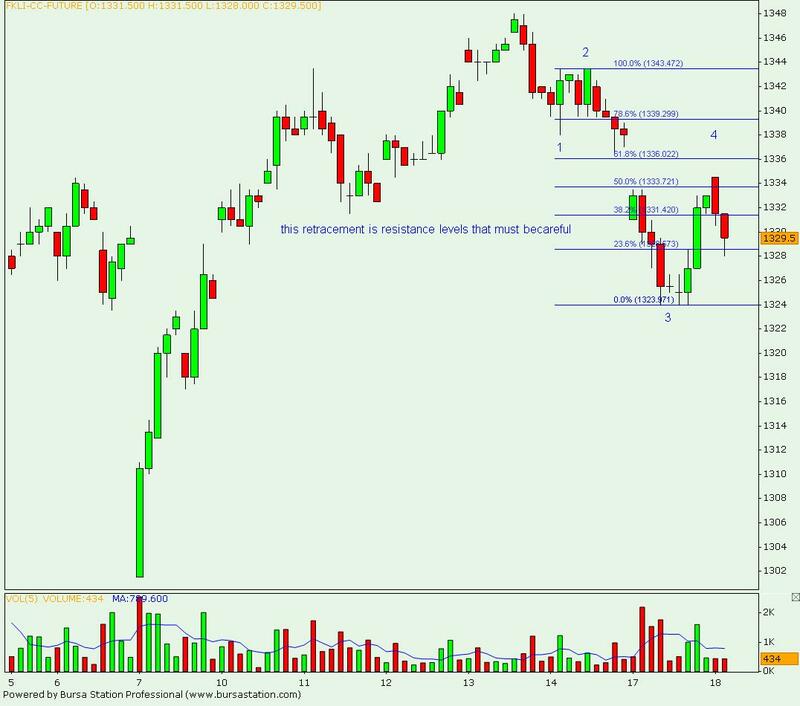 Please be alert that failure to hold above support levels at RM2455 shall indicates market would be trading south direction in the medium term trading. FKLI May Futures contract was traded 3.5 point lower as compare to previous trading session to close at 1338 levels with a total of 5,083 lots traded in the market. FKLI was trading lower during trading sessions as regional indices and Dow Jones futures electronic trading were traded lower during trading sessions. FKLI opened unchanged and consolidate for 5 hours before starts from trading lower as effort to penetrate resistance levels at 1343; 50% Fibonacci resistance levels. Technically, FKLI seems undergoing some correction phase where support levels at 1328.5 and 1323; 61.8% and 78.6% Fibonacci support level; seen at critical value in order for uptrend definition to remain intact. However, FKLI must trade above resistance level at 1343 and 1352.5 in order for uptrend to resume with strength.